Video: How to set up and get alerts and notifications to your mobile phone. Note: Mobile Notifications are only available to Pro Package subscribers. The PropertyRadar mobile app provides mobile push notifications to your smartphone. Mobile notifications are different from SMS text messages in that you can interact with and directly act on them from your smartphone. When you receive a mobile notification, you can swipe to reveal the options to SAVE that property or view the property DETAILS. By choosing SAVE or DETAILS, the PropertyRadar mobile app will automatically open to that property making it quick and easy. Mobile notifications allow you to stay on top of changes in your market, and act on new information as it becomes available. Once you enable mobile notifications from a saved search, you can stay in the know of potential deals, opportunities, or changes to your FARM. To set up the PropertyRadar mobile app: download the mobile app, then enable the app using your desktop/laptop login. Make sure you have an iPhone or Android smartphone that is running a current version of its operating system. Download and update the PropertyRadar mobile app to your smartphone. Make sure you have version 1.4 or later. If you already have the PropertyRadar mobile app installed, version 1.3 or earlier will not work. Log in to the PropertyRadar mobile app on your smartphone using the email address associated with PropertyRadar and password. The mobile app requests your approval for sending mobile notifications and to use your location. Accept these requests. The location service is only used to identify properties that are near to your present location. Note that you can turn off mobile notifications and location services using your smartphone's mobile notifications and location services management settings. Login to PropertyRadar on your desktop/laptop computer.If you do not yet have saved searches and alerts set-up, go through the instructions at Setting Up Saved Searches & Alerts. 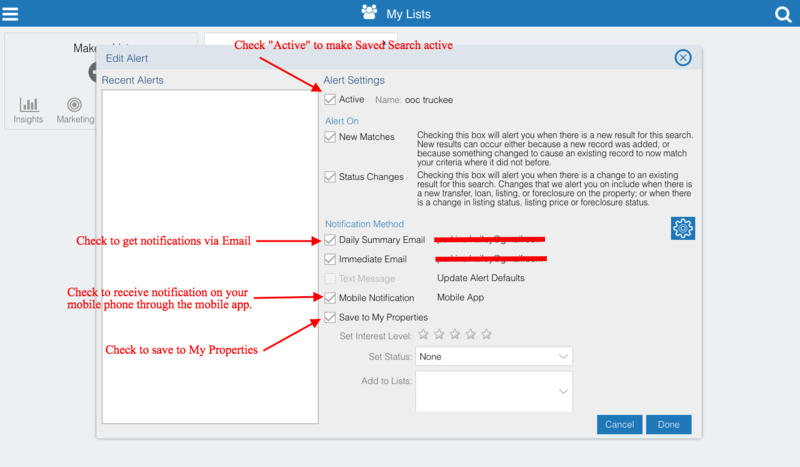 If you already have saved searches and alerts set-up (and are getting SMS alerts), click for the alert(s) you want to change in your My Lists alerts section. In the Edit Alert window, select the checkbox for Mobile Notification. You may want to disable the Text Message option if you are already using to avoid multiple notifications and SMS text alerts.